This genus consists of one species of deciduous shrub, found in scrub on poor, dry, acid soils, mainly in coastal regions of eastern N America. Comptonia peregrina is an elegant plant but is seldom seen in cultivation. The leaves are aromatic, with a fragrance more noticeable in early morning and evening. They were used by native N. Americans as a poultice for toothache and in a wash for poison-ivy rash. The herb was a popular household remedy for diarrhea in the 19th century. Comptonia is named after Henry Compton (1632-1713), Bishop of London. 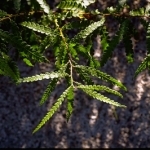 Shrub with fern-like, narrowly lanceolate, regularly lobed leaves, to 12cm (5in) long, clad in rust-colored hairs. Flowers appear in summer; males catkin-like; females smaller and spherical, followed by small, shiny brown nutlets. Cultivation: Well-drained to dry, acid soil in sun or partial shade. Propagation: By seed sown when ripe; by removal of rooted suckers in spring; by layering in spring. Difficult to transplant successfully. Harvest: Leaves are cut in early summer and dried for use in infusions. Properties: An aromatic, astringent herb that controls bleeding and discharges. Medicinal Uses: Internally for diarrhea, vaginal discharge, dysentery, and vomiting of blood. Externally for mino hemorrhage, rashes, stings. Culinary Uses: Fresh or dried leaves make a pleasant herb tea.